This is a nice twist on regular hummus. 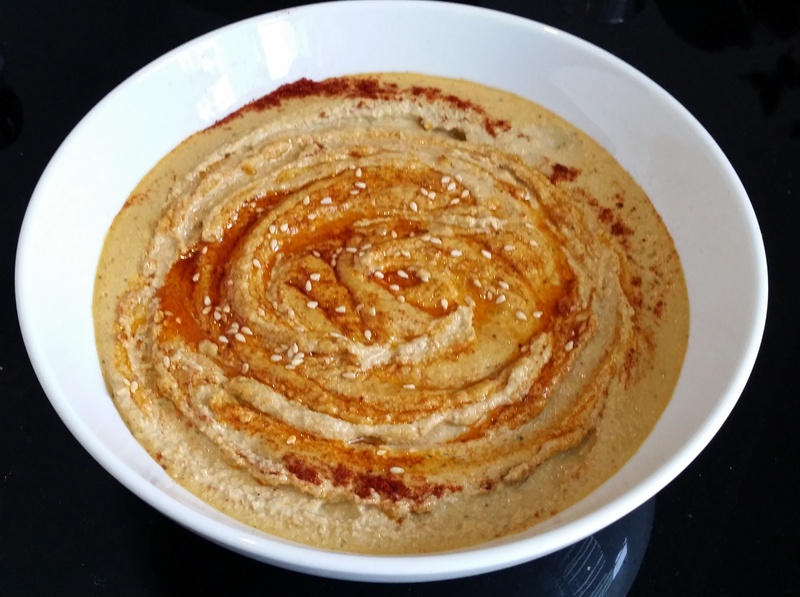 Using almonds instead of chickpeas give the hummus a nice luxurious feel. The almonds do take a bit of prep work, but it’s so worth it. Soak the almonds overnight in plenty of water. The next morning, slip the skins off and rinse the almonds. Bring a large pot of water to the boil, add almonds for 3 to 4 minutes, and then drain. In a food processor, process almonds until you get a fine meal. Add tahini paste, garlic, lemon juice, basil (if using), olive oil, cumin powder, paprika and salt and pepper, process until well combined. Add water 2-3 tablespoons at a time while the processor is running. Keep adding water until the almonds turn into a paste. You don’t want to add too much water as you still want the dip to be thick. Once it reaches your desired consistency, pour out into a bowl. Pour olive oil on top, sprinkle paprika and sesame seeds. Using the handle of a spoon, swirl the oil mixture over the top of the dip. Serve with falafels, grilled meat or over even over some seared salmon. Enjoy!